Last week, Field day took place at my school. I am a very competitive person, so when I found out that each class was assigned a team color (ours was white), I immediately knew we had to not only work hard to win, but we had to look cute doing it. I decided to include my classroom theme (and my love for Mickey Mouse) on my class t-shirts. The only problem was, how was I going to decorate twenty-three shirts without spending a fortune? After thinking of several techniques, I came up with a simple, inexpensive design. 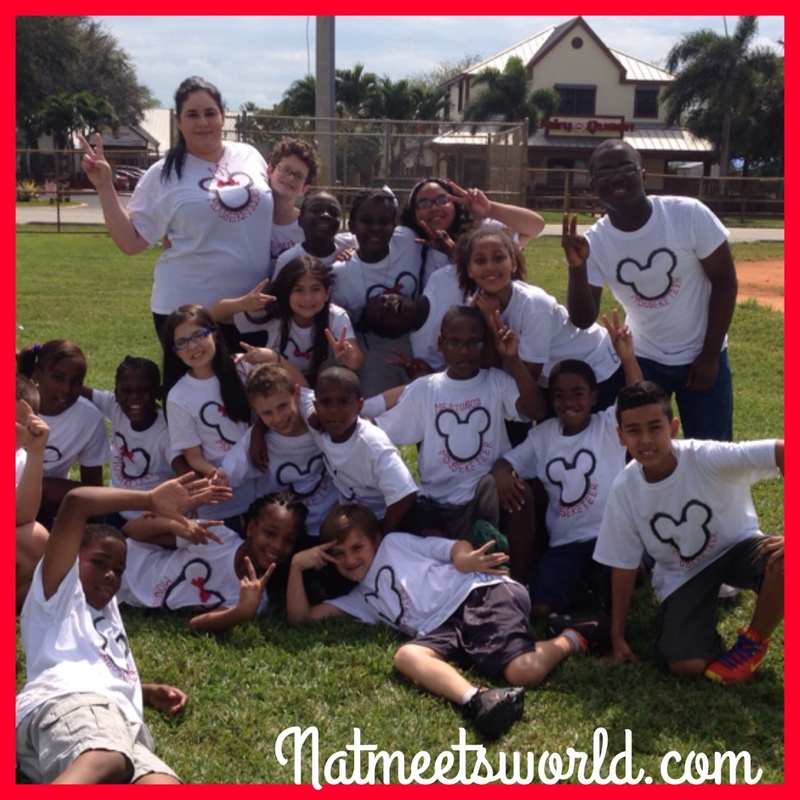 These shirts are not only great for a class activity like field day, but for a family heading to Disney World as well. Black and red fabric paint (I also used yellow because I wanted to write everyone’s name on the back of their shirt. I used yellow so that I could incorporate all three Mickey colors). Now that you have your materials, it’s time for the fun stuff! 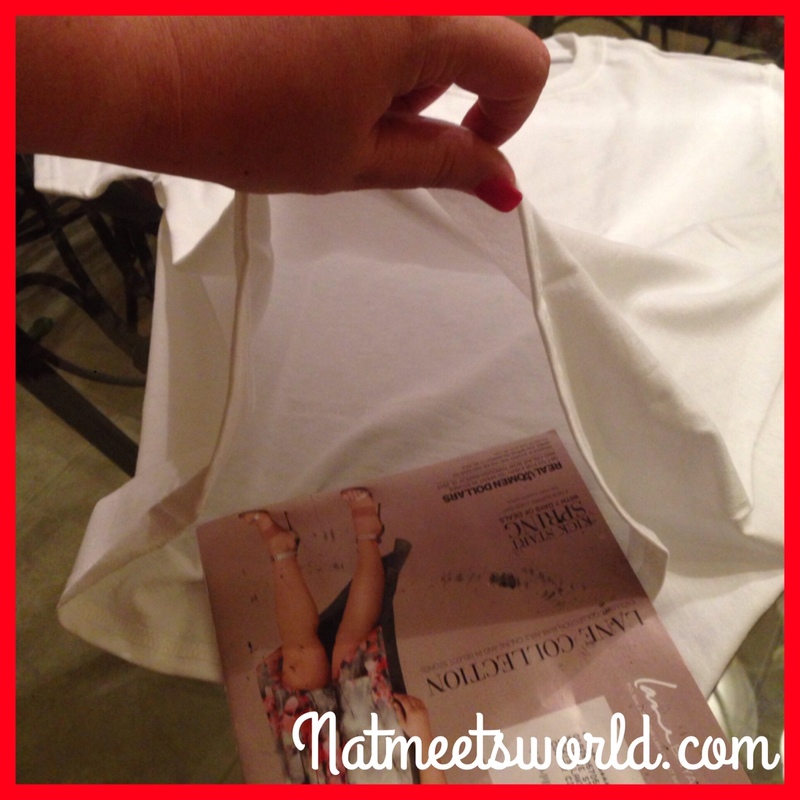 Step 1: place a magazine (preferably one that you don’t care for anymore) between the front and back of the shirt. You do not want the paint to go through the front of the shirt. 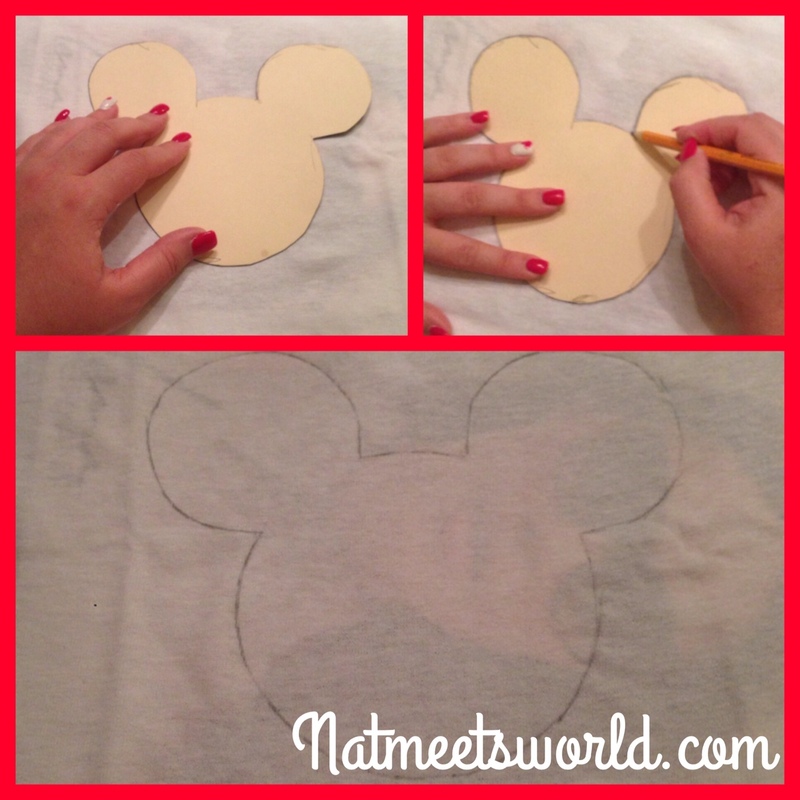 Step 2: Position your Mickey template in the center of the front of the shirt. Hold tightly with your non-writing hand. 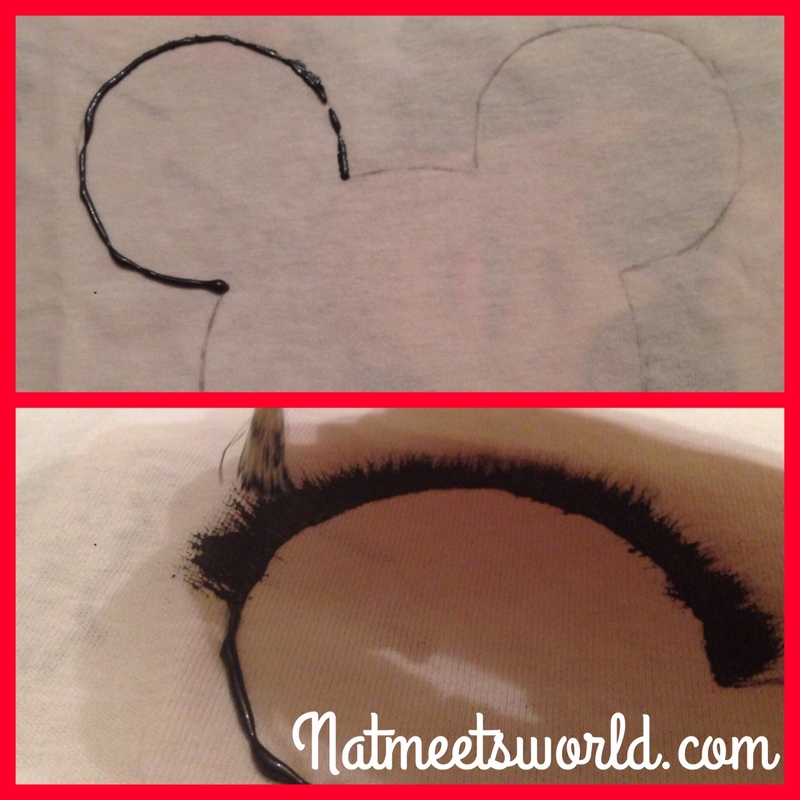 Use your pencil to trace the silhouette onto the shirt. You will need to move your pencil back and forth while you trace, unlike the way you normally use a pencil while writing. The shirt is not as easy as a sheet of paper, however, it will work nicely. 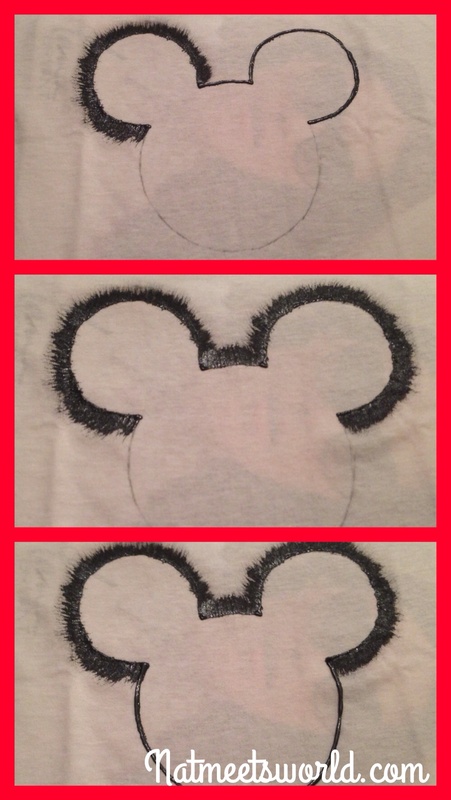 Step 3: Grab your black fabric paint and go over the pencil line of one Mickey ear. After this, grab your paintbrush and ‘flare’ the paint outward to your desired length. 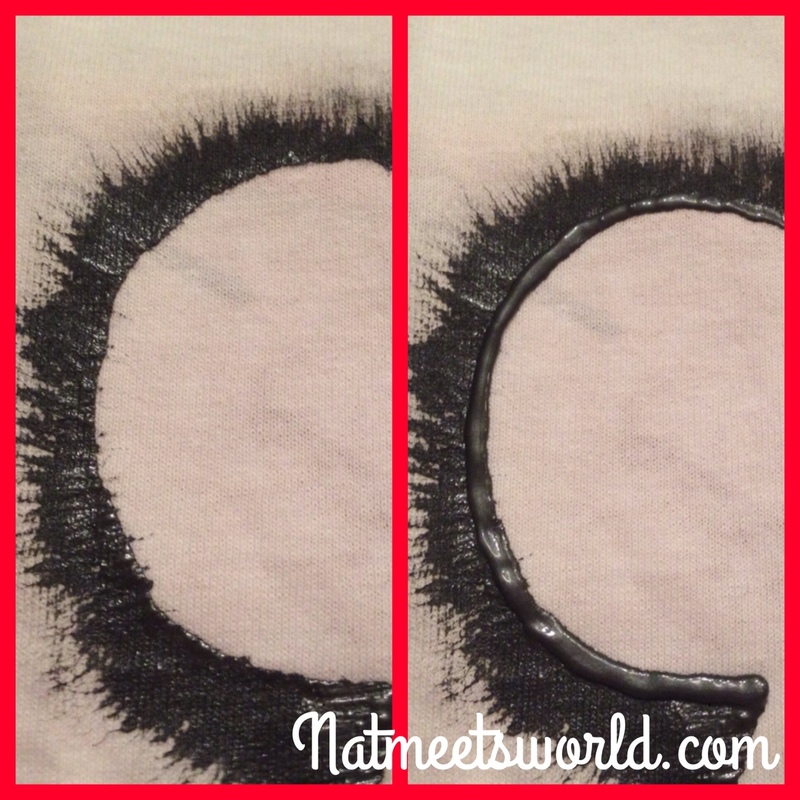 After completing one ear, go ahead and use the black fabric paint to trace over the pencil on the other ear. Then repeat the paintbrush ‘flare’. After both ears have been done, you can trace the rest of the Mickey silhouette with the black fabric paint and flare it out as well. 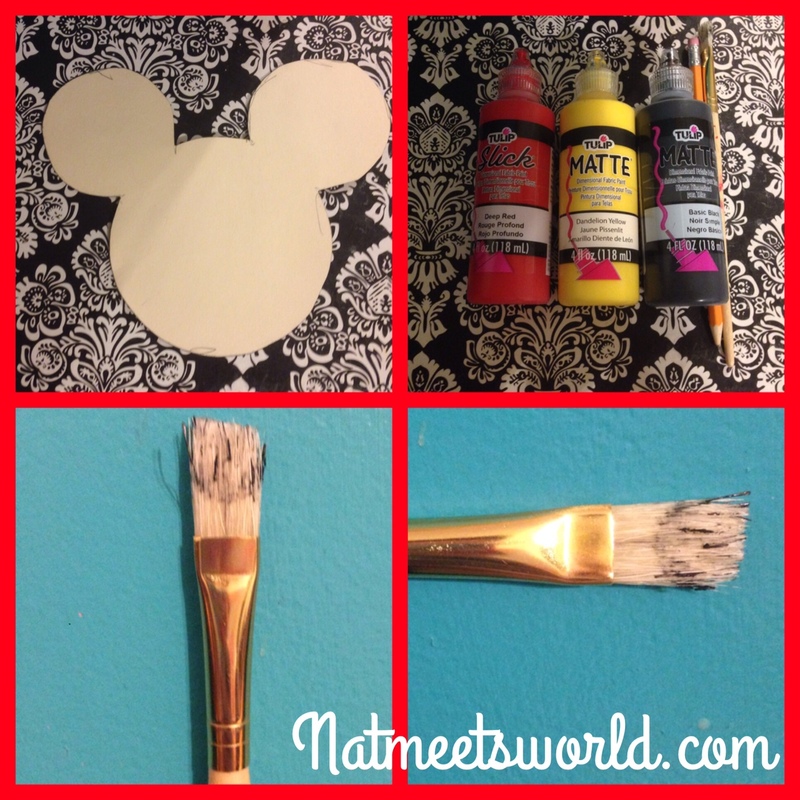 Click below to see a short video clip of how I flared the paint on my Mickey silhouette. Step 4: I ‘cleaned’ up my lines by going over the initial black fabric paint to ensure that it looked ‘cleaned’. In the picture below, the left shows the original line, the right shows how I went over it to make it look perfect. Step 5: Let your shirt dry in a safe place (preferably overnight). 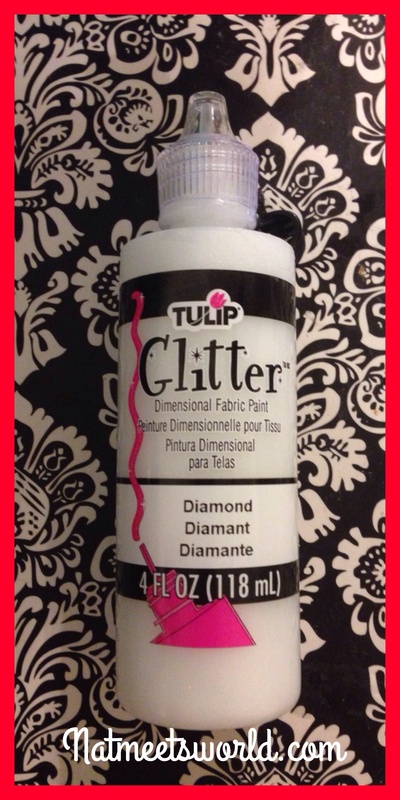 Once it is dry, if you would like to add a light hint of glitter, you can squirt some glitter paint on a paper plate, dip your paintbrush into it, and lightly brush it on the ‘flared’ part. I did this to each of the shirts, and while it isn’t visible in a picture, it looked really nice in the sunlight. 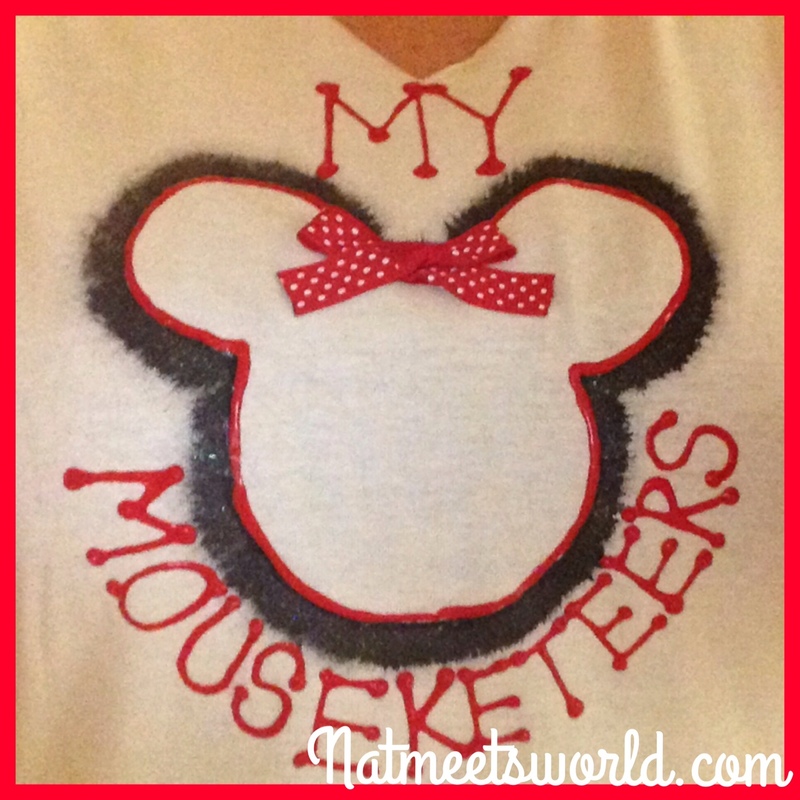 Step 6: I decided to write ‘mouseketeers’ on my shirts because I always call my students my mouseketeers. 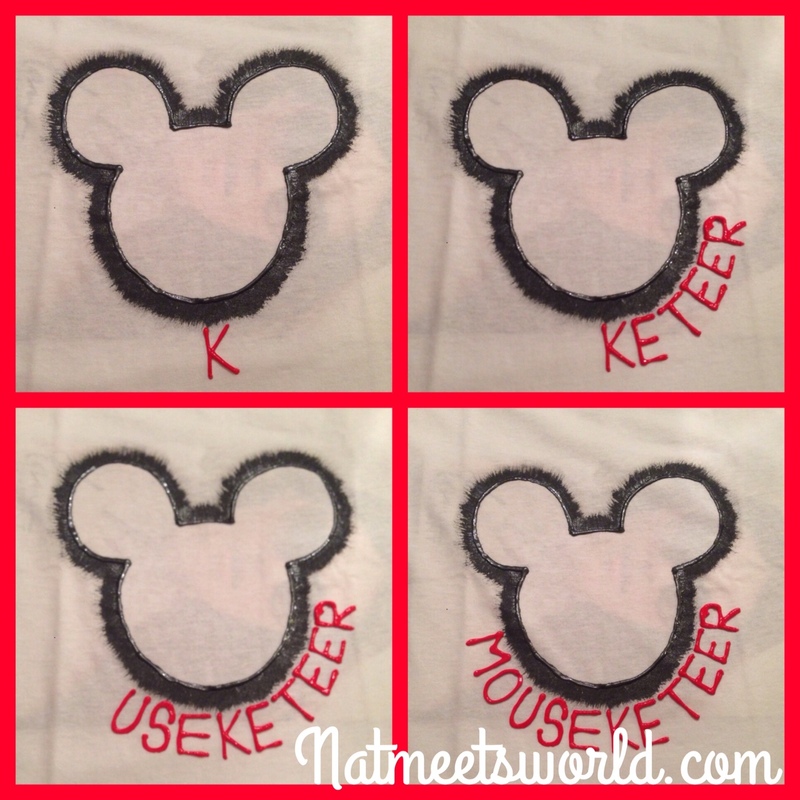 In order to position the word ‘mouseketeer’ in the center, I started with the letter in the middle of the word mouseketeer, which was ‘k’ and wrote it in red fabric paint in the very center of the bottom of the Mickey silhouette (below: top left). I then continued to write ‘keteer’ along the right side (below: top right). After that, I worked my way backward to write the word ‘mouse (below: bottom left). The finished product (below: bottom right) shows that the word is centered. I set these to dry overnight again. Step 7: Since I also love Minnie Mouse, I took red ribbon with white polka dots and made a bow with it. I used a hot glue gun to glue it onto my shirt. I decided to do this for all of the girls in my class. It was a very simple and cute addition to the shirts. Below is a picture of my shirt with the Minnie inspired bow. I also used the red fabric paint for my ‘clean line’ as mentioned in step 5. I used the yellow fabric paint to write each name on the back of the shirt. The kids absolutely loved the shirts, and when we headed out to the field, I did not see one person that wasn’t smiling when they saw us. Everyone approached me about how great the shirts looked, and how they wanted to make them for their family. Have fun making your shirts, and send me a picture when you wear them! Disclosure: All pictures and opinions are my own.